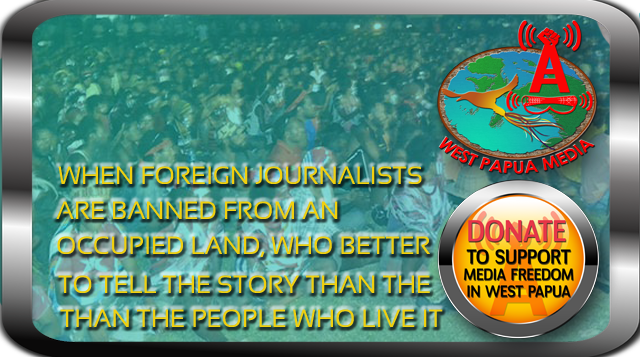 West Papua Media Alerts reports the latest independently verifiable news from West Papua. News reports are posted by journalists, both on the ground in West Papua, and around the world. Reporting in West Papua is a highly risky business. Journalists, Papuan and outsiders alike, are under constant threat for reporting West Papua, with four journalists dying in suspicious circumstance in 2010 alone. Anywhere journalists report fearlessly they are targets, but most journalists in West Papua simply put up with it, they have no other option. What can international media do to lessen their risk? Partly in response to this danger and partly to give local journalists a voice globally, West Papua Media (WPMA or WestPapuaMedia.Info) was started. It aims to provide a professional service to international media covering West Papua,ensuring high quality, verifiable reporting gets into the international media, directly from the ground, and not from those who seek to distort the truth of daily experience in Papua. By reporting Papuan campaigns to end human rights abuses and bringing these unreported Papuan issues to the front page, we hope to hold the abusers to account. With an ever growing stable of committed and disparate voices from citizen media to professional journalists, West Papua Media is proud and excited to be part of this movement. Some of our real time work has assisted directly in the prevention of mass acts of violence by the Indonesian security forces, such as our coverage and media advocacy fixing of the July 8-9 Otsus Gagal demos and occupation of the Jayapura DPRP. West Papua Media is also excited to be now hosting Safe Witness Journalism training for citizen media, human rights workers and professional journalists from Papua, and covering Papua. Significant financial support is required to deploy this training to where it is most needed – please contact us for more details.